Me VS. The Sugar...: Still Breech? We had our doctor's appointment, but we still don't know if the baby is still breech. I've been feeling her move, and I think she's horizontal now, like a little football. We didn't get any confirmation, though. The Dr. said she'd probably check next week and then go from there. In the meantime, I'm just hoping the baby moves!!! We waited an hour to see the doctor for less than 5 minutes, and I was second in line. I feel bad for the others that showed up after me. You could seriously spend all afternoon there if you get there at the wrong time! By the time we got out, it was almost 10:30 so we decided to have a late breakfast/early lunch. 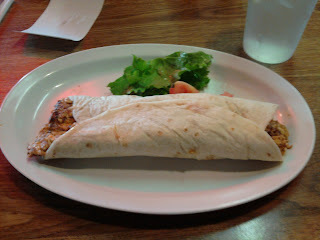 We went to Chicago's and were glad to see they were still serving their breakfast burritos. I had the egg, chorizo & beans, but only had about 2/3 of it. They are really filling! I brought an apple for a snack later, but I'll probably head out to look for something a little sweet when I'm back in the office.